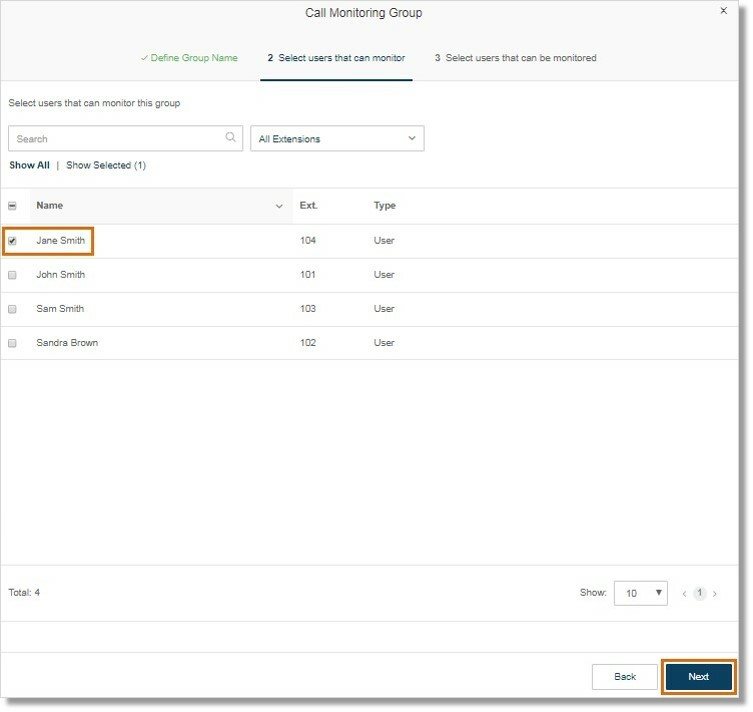 The Call Monitoring feature allows authorized Users to access another extension’s call in real time, providing them with Quality Assurance and coaching tools. The feature works by giving Users permission to monitor others and selecting Users that can be monitored. It works well with Office@Hand desk phones that support presence. 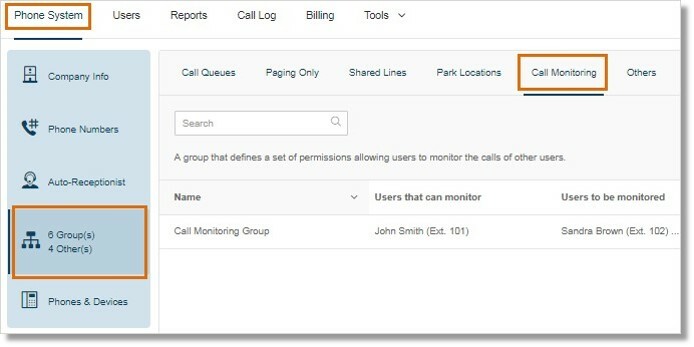 You can access the Call Monitoring section by going to Phone System > Groups > Call Monitoring on the Admin Portal. Who uses the Call Monitoring feature? This capability is typically given to a supervisor/manager to allow monitoring of an employee’s performance. These are the users whose performance should be monitored or evaluated by the supervisor. Note: You need to be logged in to the Office@Hand Online account as an Administrator before proceeding with the links below. Setup Presence on the on the extension that needs to monitor calls, making sure that the extensions that need to be monitored appear on that phone. 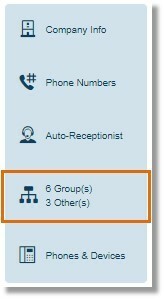 Go to Phone System > Groups. Click Call Monitoring, then click the New Call Monitoring button. Enter the name of the Call Monitoring group, and then click Next. Select the users that can monitor a call then click Next. Select the users that can be monitored and then click Save. On the phone that was setup for Presence, press the soft key for the extension that should be monitored. To coach the user being monitored, press *81. To go back to Monitoring, press *80. 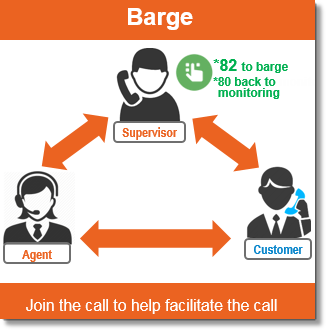 To join (barge) the call, press *82. To go back to Monitoring, press *80. To take over the call, press *83. Dial *80 to monitor a call. When prompted, enter the extension you need to monitor and press pound. 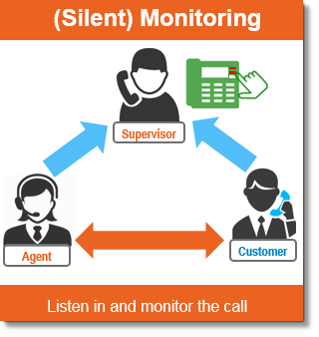 Call monitoring allows you to listen to all parties in an active call without transmitting any audio yourself. Dial *81 for call coaching. When prompted, enter the extension you wish to coach and press pound. 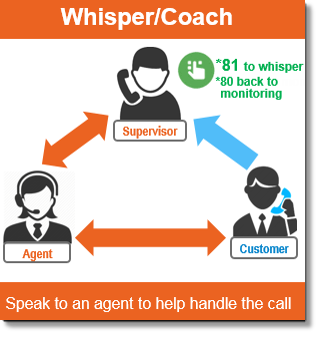 Call coaching allows you to speak directly to the extension you are coaching while they are in a call, without transmitting audio to the other party. Dial *82 for call barge. When prompted, enter the extension you wish to barge and press pound. Call barging allows you to join another extension’s in-progress call and communicate with all parties as if you were added via intercom. Dial *83 for call takeover. When prompted, enter the extension you wish to takeover and press pound. 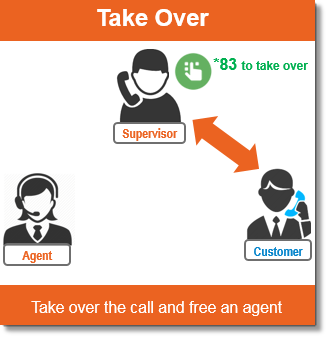 Call takeover allows you to disconnect an extension while they are in a call and take their place as an active call party member. Note: This can be done on Office@Hand for Desktop app as well as the mobile app, with limitations. The apps do not support the Takeover feature. IMPORTANT: On-demand call recording will not work from the Office@Hand for Desktop app when monitoring another call. If you need to record calls that are regularly monitored, consider automatic call recording. It is your responsibility to consider local legal responsibilities when recording phone calls.